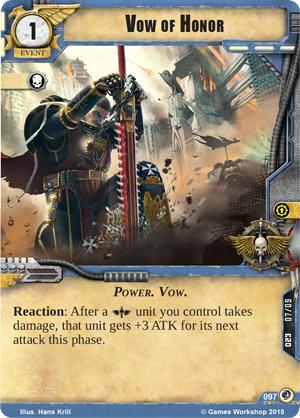 Fantasy Flight Games is proud to announce Wrath of the Crusaders, the fifth War Pack in the Planetfall cycle for Warhammer 40,000: Conquest! The Astra Militarum fights desperately to hold Sacaellum against an onslaught of xenos and Warp-born monstrosities. In the midst of this worldwide battle, a detachment of the Black Templars arrives. The Black Templars have not come to save this planet. Rather, they are intent on recovering the holy relics of St. Camila – relics infinitely more valuable than the planet and the lives of all who live there. Like the other War Packs of the Planetfall cycle, Wrath of the Crusaders offers new play styles and gives planet type symbols significance beyond achieving victory. When you fight on the planets that suit your faction’s goals, you’ll quickly discover that your armies become much more effective. 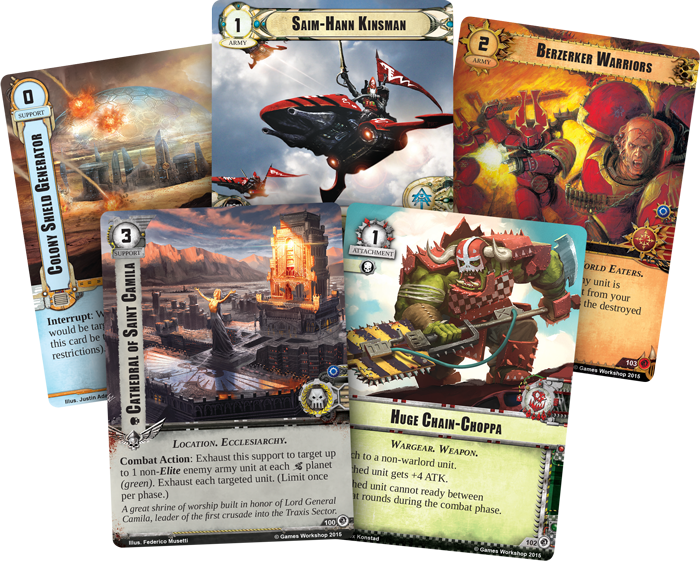 This War Pack also offers a new Space Marines warlord and his eight-card signature squad, along with fifty-one cards for other factions (three copies each of seventeen distinct cards). When the Black Templars arrive on Sacaellum, you decide the success or failure of their quest! Wrath of the Crusaders offers you the opportunity to lead the Black Templars into battle under the command of Chaplain Mavros (Wrath of the Crusaders, 93). In battle, Chaplain Mavros has the ability to inspire the Space Marines under his command to fight their hardest to recover the relics and archaeotech that can serve the Imperium. Twice per phase, you may use Chaplain Mavros’s Action to deal one damage to a Space Marines unit you control at a blue tech planet. Then, the targeted unit gains a raised ATK until the end of the phase. This ability not only gives you the chance to increase your units’ ATK, but many Black Templars units benefit from the Unstoppable specialization, which triggers when the unit is assigned damage. 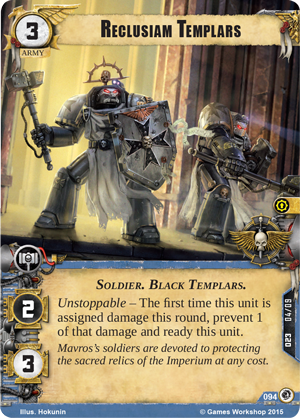 By using Chaplain Mavros to trigger your units’ Unstoppable abilities, you can forge the Black Templars into a well-honed war machine. Within Chaplain Mavros’s signature squad, you’ll find three units that could benefit from his leadership. These are the Reclusiam Templars (Wrath of the Crusaders, 94), Black Templars units that bears an Unstoppable ability. The first time a Reclusiam Templars unit takes damage each round, you can prevent one point of that damage and ready the unit. This ability naturally makes the Reclusiam Templars excellent defenders, able to take damage and strike back at full force. When you combine Mavros’s inspiration with the Reclusiam Templars, you gain a unit that can ready on command and benefit from increased ATK! Chaplain Mavros’s signature squad breaks away from the traditional signature squad structure by only including three copies of the Reclusiam Templars. Instead of a fourth Reclusiam Templars, the fourth slot in the squad is taken by The Emperor's Champion (Wrath of the Crusaders, 95). The Emperor’s Champion is an unparalleled warrior, chosen and blessed by the Emperor, and he will seek out any enemy commander and challenge him to single combat in the name of the Emperor. Such a warrior is a deadly threat to your opponent’s plans. In addition to being a dangerous combatant, The Emperor’s Champion allows you to choose a target enemy army unit during each round of combat. The chosen unit must attack The Emperor’s Champion during your opponent’s next combat turn, giving you unsurpassed control over how the battle unfolds. Damaging your own units with Chaplain Mavros can reap powerful rewards, but you must be cautious of doing too much of your enemy’s work for him. 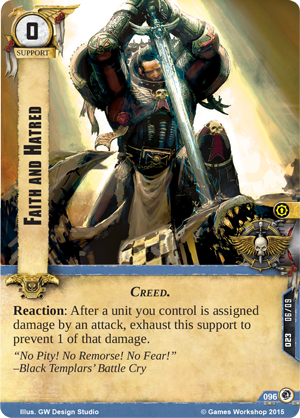 Fortunately, you can prevent some of that damage with Faith and Hatred (Wrath of the Crusaders, 96), a free support that can be exhausted to prevent a single point of damage. Even when your units are damaged, you can turn that damage to your advantage with Vow of Honor (Wrath of the Crusaders, 97). There are two copies of this event included in Chaplain Mavros’s signature squad, and by playing one after a Space Marines unit takes damage, you can greatly increase that unit’s ATK for its next strike! 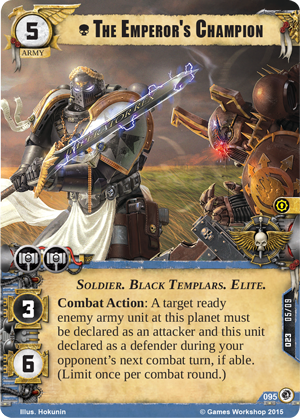 As the Black Templars search for relics on Sacaellum, they must withstand every enemy attack. One way for you to increase a unit’s resilience is the Ancient Crozius Arcanum (Wrath of the Crusaders, 98). This signature attachment can be given to any unit you control, and the attached unit gains a powerful Unstoppable ability: the first time that unit is assigned damage each round, you can prevent one point of damage and remove one damage from the unit! 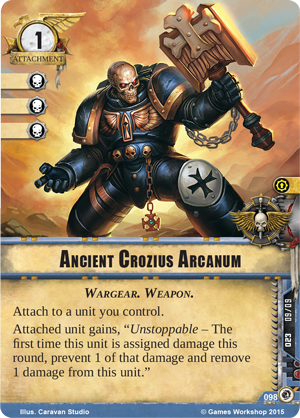 Of course, you could give the Ancient Crozius Arcanum to your warlord to prevent him from being bloodied, or you could equip it to The Emperor’s Champion to support him in his battle for the Emperor’s glory. 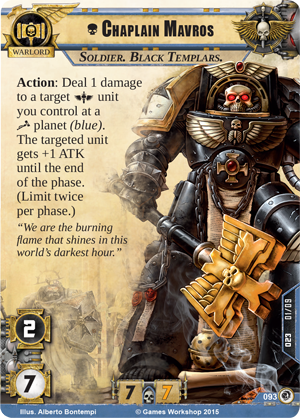 The Black Templars have arrived to save the priceless relics of Sacaellum, but dark forces are working to claim these same relics for their own. Travel to the Traxis sector, take command of the Black Templars, and fight for the honor of the Emperor. Look for Wrath of the Crusaders at your local retailer in the first quarter of 2016! 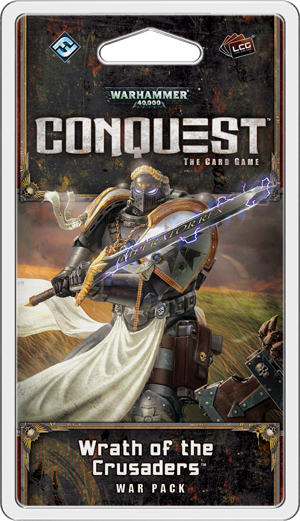 Warhammer 40,000: Conquest: Wrath of the Crusaders © Copyright Games Workshop Limited 2015. Conquest, the Conquest logo, GW, Games Workshop, Space Marine, 40K, Warhammer, Warhammer 40,000, 40,000, the ‘Aquila’ Double- Headed Eagle logo, and all associated logos, illustrations, images, names, creatures, races, vehicles, locations, weapons, characters, and distinctive likenesses thereof, are either ® or TM, and/or © Games Workshop Limited, variably registered around the world, and used under license.